I don’t fry often because deep-frying anything is time consuming, expensive, fattening and messy but the great thing about these chicken tenders is that you’re really just pan-frying them. You just use enough oil to cook the tenders on each side - you don’t have to submerge them in the oil. Chicken tenders are great for this cooking method because they’re light enough that they won’t sink to the bottom of the pan and burn and they are small enough to cook quickly. Season chicken with 1 tablespoon Chicken Scratch; set aside. Whisk egg, milk and hot sauce in a shallow bowl; set aside. Combine remaining 1 tablespoon Chicken Scratch, flour, black pepper and dry mustard in a shallow bowl; set aside. Working in batches, dip seasoned chicken in egg wash then toss to coat in flour mixture. Place chicken on a cooling rack or plate lined with wax paper and refrigerate until ready to use. Allowing them to rest a bit will help the breading stick to the chicken tenders. Heat 1 inch of vegetable oil in a large cast iron skillet until temperature reaches 335-340 degrees. Fry the chicken until golden brown and crispy, turning once (about 5 minutes) then drain on cooling rack or paper towels. Serve with honey mustard or your favorite dipping sauce. P.S.... I have it on good authority that Chick-fil-A Sauce is just honey mustard with a little barbeque sauce mixed in. YUM! I just put chicken tenders in fridge for supper. NOW I know what to do with them. Thanks. That chicken scratch seasoning looks awesome! I might have to do this! As a person who respects ALL life, I find this quite disgusting and completely unnecessary. I didn't used to, but when one discovers the truth about what happens to these animals before they make it to our plates, it's a whole different ballgame. Eating another living being. It's not necessary. Animals value their lives every bit as much as you value yours. I am a 100% vegan and I don't feel deprived of anything--taste, texture, eye appeal, you name it. I am also much healthier for having made the switch. Google "free range chickens" or "factory farming" to get an education as to what it really means. I used to buy all "cage free" chicken eggs thinking I was doing a good thing. Then I got educated and quit eating eggs altogether. www.earthlings.com is a good place to start. Of course, I realize that not all chickens that are slaughtered live in such horrific conditions prior to their slaughter. But nevertheless, my comments stand. There is no such thing as "humane killing." If you think there is, then would you consider trading place with the chicken, or do you value your life too much? And please, spare the rhetoric about nuts and berries. Plants do NOT have the breath of life in them (i.e., souls). Oh shut up and get off the girl's recipe! For heaven's sake why did you CLICK ON IT if we're so disgusting! Geez! I can see why you are shown as "Anonymous". Why would you ever look at a chicken recipe if you don't eat it? Would suggest you take your plastic shoes and clothing (and ignorant comments) someplace else. being vegan is a choice, one that you have made. that does not give you the right to sanctimoniously condescend to anyone else that has not made that same choice. doing so is one of the reasons so many people look down on vegans and consider them idiotic. while i'm sure you are in fact quite intelligent, commenting about the cruelty of eating chickens on a page for a chicken recipe doesn't exactly do the appearance of your intelligence any favors. also, to say that plants do not have the breathe of life and do not have souls is an opinion, just as believing that chickens have souls is an opinion, to which you have a right, but that right stops when it comes to forcing, guilting, or hoisting it upon others. i believe the earth is a living thing, and that without things such as trees and grass there would be no animals, or people around to have souls. you owe your very existence to plants, especially as a vegan. speaking so lightly of their importance does your intelligence no favors either. if you want to make a difference and get people to stop eating meat, therefore cutting down on the contribution to keeping the cruel practices of the food animal industry thriving, the first step is to present yourself with intelligence. people respect intelligence. people do not respect condescension, rudeness, guilting, blaming, or any other of a number of tactics typically reserved for politicians. figure out how to be a vegan without denigrating those around you and you be much more successful. until then, people will continue to dismiss anything you say as the paranoid rantings of an idiot, and rightly so. No one is making you eat or cook this. If you choose to not eat meat that is your own business. Do NOT judge others for the choices they choose to make. Didn't your mammas raise you better. Dear lord. a 1/4 cup of hot sauce sounds like a fair amount. does it make it quite spicy? and could I just take that out of the recipe without it making it taste off? I made the Chicken Scratch and the Fried Chicken Tenders tonight. The seasoning was just perfect...not too spicy but not bland, either. 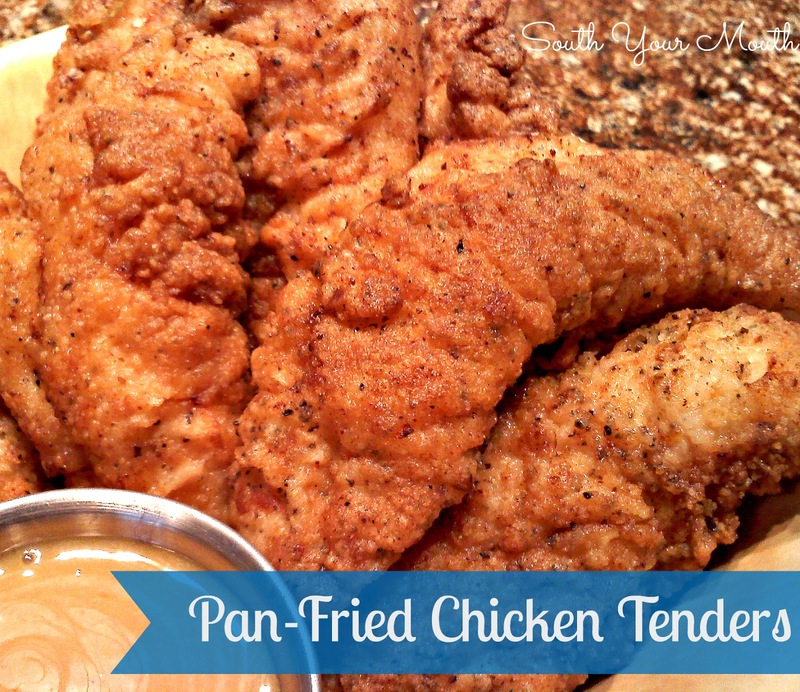 The tenders cooked up as pretty as the picture used on this recipe. They were delicious! The breading cooked up light and tender. It wasn't heavy at all. This is my go-to Chicken Tender recipe from now on! Thanks for sharing it, Mandy! Holy cow this recipe is amazing. Love the chicken scratch seasoning. Another Chick-Fil-A taste trick is to soak your tenders or fillets in pickle juice for at least an hour before breading. This really adds a wonderful twist! Pickle juice for brining...gotta try this. Thanks for sharing this! Kosher or regular table salt? Looking forward to trying this recipe - Thank You for sharing!! Gonna try this recipe tonight and see how it goes! Will this work without the egg???? My daughter has a food allergy. Hi Jessica when I run out of eggs I often use flaxseed for any recipes calling for eggs. I found it on the back of the bag. I've used in corn bread and it was not bad at all. I'm not sure the conversion right off hand but you should be able to find it no problem! Chick-fil-a sauce is a mixture of honey mustard, barbeque, and ranch! This recipe looks great, thanks for posting! I dip chicken tenders and most everything else in Comeback dressing, a Mississippi staple. I'll be making these.